Unlike most knives of the knives in my collection where I was initially drawn in by the feature set, the Benchmade 670 drew me in because of its uncommon good looks. Of course, it certainly didn't hurt matters that the practical features that I look for were also present. The visual appeal for me was the semi-retro look of the black textured handle combined with the brushed metal bolsters. Having seen only photos and reading a few scattered opinions, I went ahead and ordered the knife, hopeful that I wasn't making a big mistake. Benchmade does make good knives. Rarely does anyone have anything bad to say about them, however, the 670 is a new offering and is therefore subject to the growing pains of new products. I kept this in mind while I waited for the knife to arrive. The 670 comes in a standard Benchmade box. Also inside the box is a small pouch for storing the knife and two allen wrenches for making adjustments as necessary. These adjustments come in two forms: tightening or loosening the pivot motion of the blade and removing or adding the spring bar that is responsible for the assisted-opening action. The knife is hefty and very well-made. Some may be put off by just how heavy it is, but I like it. It feels good in the hand and its heftiness instills confidence that it do any job put to it. The bolsters are solid and no dout account for much of the weight. Unlike other assisted-opening knives that I have, the 670 does not have lever on the blade that protrudes from the knife's spine allowing for a reasonably safe opening. Instead, the only method of opening the knife is to use the thumb-stud. I'm not a particularly big fan of the thumb stud because I always feel that if I am going to make a mistake while opening the knife, it will somehow be involved. This feels doubly true when assisted-open enters the picture because as you press on the thumbstud, the blade suddenly flicks fully open and your thumb is left dangling. Caution and a bit of practice go a long way to preventing the loss of blood. I also dislike the first few days of knife-thumb, which comes from the excessive opening and closing of the knife and the stud gouging into your finger wearing off the tender flesh. Fortunately, after a few days a callous appears and this is no longer an issue. As I received it, the pivot screw of the 670 was a little tight, which hindered the assisted-opening action. A few twists of the allen wrench solved this problem. For a nice smooth action, some people might find the pivot has to be adjusted a bit too loose--I find there is some side-to-side play in the blade. Not enough in my opinion to be annoying or dangerous, but enough that real purists might be put off. After cycling the knife open and closed a dozen or so times, a new problem started to reveal itself: it was becoming increasingly difficult to open the knife. At first I thought the pivot had somehow tightened itself, but this was not the case. 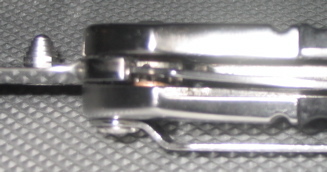 I examined the assisted-opening mechanism and discovered that the spring bar was wearing away and leaving small fragments of metal debris on the place where it makes contact with the blade. It was this grit that was causing excessive friction during opening. The friction became so extreme that I simply could no longer open the blade. I became very concerned that the knife I liked so much was suddenly useless as a practical tool. I promptly contacted Benchmade about this problem and they told me to send the knife and five bucks for return shipping and they would check it out. Good deal, and if I hadn't been so impatient, I would have definitely taken them up on it. Being the weekend that it was, however, I made my own plans for solving this problem. Examining the area where the spring bar made contact with the blade, I saw that the angle on the bar wasn't ideal. It should have been slightly shallower. Given that the spring bar was wearing away as a result of opening and closing, I took advantage of this and kept moving the blade back and forth in the area that had the greatest resistance. I probably cycled that blade a good one thousand times before I was satisfied with its motion. I suspect that if this problem was not limited to just my knife that it will be quickly remedied by future production runs. One area of concern for me was the liner lock. I generally dislike liner locks because of the possibility of failure. Having a blade close down on your finger tips is not my idea of fun. I carefully examined the lock and don't believe that it will fail with even rough use. Assuming the liner lock bent, the bend would be restricted by the liner wall and the blade would not have enough motions to reach the fingers. No promises here, of course, but I am personally comfortable putting trust in the liner lock. The blade itself is 154CM steel and is somewhat on the thin side, which seems to be typical for most Benchmade offerings. Despite the thinness, there are no complaints here. Aside from the spring bar issue--which I have no doubt Benchmade would have corrected, the 670 is a great knife. It has become my daily carry simply because I can't think of a reason not to carry it. It offers everything I look for in terms of quality, saftey, and even appearance. Enjoy the pictures, but please be aware that I am by no means a photographer.